It 's my first EVER "Currently" with Farly from Oh' Boy Fourth Grade. She Has A Big Heart! 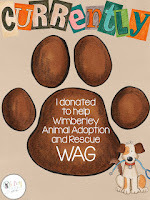 Farly is hoping to raise money through donations for Wimberley Adoption Group and Rescue. WAG is housing several animals affected by the devastation caused by Mother Nature recently. If you're an animal lover like Farly and would like to donate Click Here to go to her page and look for the "Donate" button. Then save and post the picture below to your Instagram, Twitter, Facebook or whatever social media you prefer to spread the word! Listening - My kiddos were excited about attending the Summer Rec program at a local school. It started this Monday and I'm enjoying the peace of a house with no bickering! Thinking - I was considering registering for the Teachers Pay Teachers conference this year. I'm not sure though because I will know no one there. Sure I interact with several teacher bloggers on Instagram but I don't know, know them. You know what I mean? What if I say "Hey, I know you from Instragram" and they look at me like I'm crazy! Needing - "I gotta wash that grey right out of my hair!" Ok, now I'm showing my age. That line is from a commercial for boxed hair dye from a loooong time ago. Anyone remember that commercial? Probably not! Anyhow and which is the correct word "gray" or "grey?" Well I used both so I could be half right! Summer Lovin - Woo Hoo! It's so wonderful to not have to set an alarm. Unfortunately, my body didn't get the message that school is out because when I woke up this morning it was about the same time my alarm goes off during the school year. That's OK though. The earlier I wake up the more things I can accomplish! I'm also lovin' taking the kiddos to the pool. While they get tired out I sit and soak in the sun. Only problem is that we're in 100 degree temps here in Tucson, AZ. Sunscreen, sunscreen, sunscreen! You should definitely go to the TPT conference! I went last year and didn't know a soul. Everyone was very friendly and so many others are in the same boat. I learned a lot and had a great time! Hope to see you there! I agree, you should head to the conference! Think about all the networking and friends there are to be made. It's kind of like going to the first day of school! If I could go to the conference I would so I think you should go and I can live vicariously through you-ha! We all interact through social media so I don't think saying I know you through instagram is strange at all!